Nineteench Century~Throughout history, American Indians have been among those soldiers to be distinguished by receiving the United States' highest military honor: the Medal of Honor. 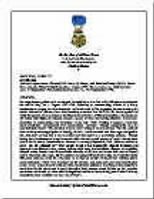 Given for military heroism "above and beyond the call of duty," these warriors exhibited extraordinary bravery in the face of the enemy and, in many cases, made the ultimate sacrifice for their country. US Army, 45th Infantry Division. Entered service at: Sallisaw, Okla. Birth: Long, Okla. G.O. No. : 5, 15 January 1945. Citation: For conspicuous gallantry and intrepidity at risk of life above and beyond the call of duty on 22 February 1944, near Padiglione, Italy. Two hours before daybreak a strong force of enemy infantry established themselves in 3 echelons at 50 yards, 100 yards, and 300 yards, respectively, in front of the rifle platoons commanded by 1st Lt. Montgomery. The closest position, consisting of 4 machineguns and 1 mortar, threatened the immediate security of the platoon position. Seizing an Ml rifle and several hand grenades, 1st Lt. Montgomery crawled up a ditch to within hand grenade range of the enemy. Then climbing boldly onto a little mound, he fired his rifle and threw his grenades so accurately that he killed 8 of the enemy and captured the remaining 4. Returning to his platoon, he called for artillery fire on a house, in and around which he suspected that the majority of the enemy had entrenched themselves. Arming himself with a carbine, he proceeded along the shallow ditch, as withering fire from the riflemen and machinegunners in the second position was concentrated on him. He attacked this position with such fury that 7 of the enemy surrendered to him, and both machineguns were silenced. Three German dead were found in the vicinity later that morning. 1st Lt. Montgomery continued boldly toward the house, 300 yards from his platoon position. It was now daylight, and the enemy observation was excellent across the flat open terrain which led to 1st Lt. Montgomery's objective. When the artillery barrage had lifted, 1st Lt. Montgomery ran fearlessly toward the strongly defended position. As the enemy started streaming out of the house, 1st Lt. Montgomery, unafraid of treacherous snipers, exposed himself daringly to assemble the surrendering enemy and send them to the rear. His fearless, aggressive, and intrepid actions that morning, accounted for a total of 11 enemy dead, 32 prisoners, and an unknown number of wounded. That night, while aiding an adjacent unit to repulse a counterattack, he was struck by mortar fragments and seriously wounded. The selflessness and courage exhibited by 1st Lt. Montgomery in alone attacking 3 strong enemy positions inspired his men to a degree beyond estimation.